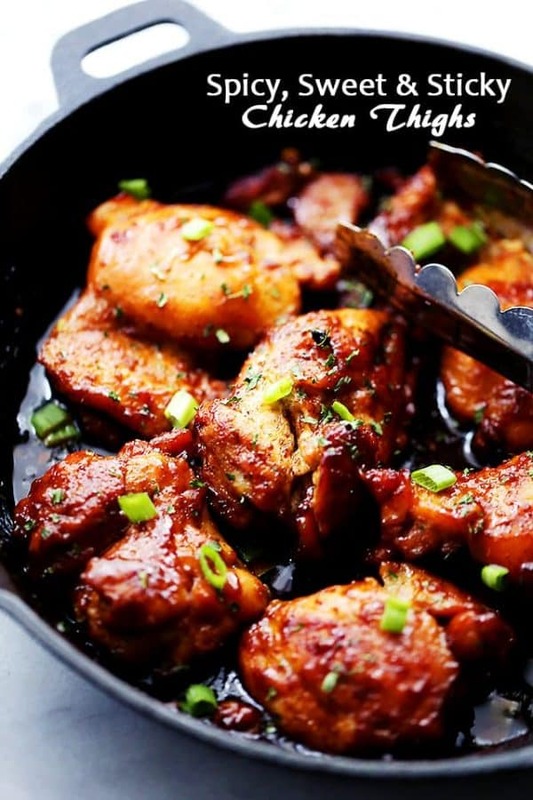 Spicy, Sweet and Sticky Chicken Thighs – An easy and quick one skillet meal including sticky, tender and delicious chicken thighs rubbed with a homemade spice rub and brushed with an amazingly sweet honey sauce. 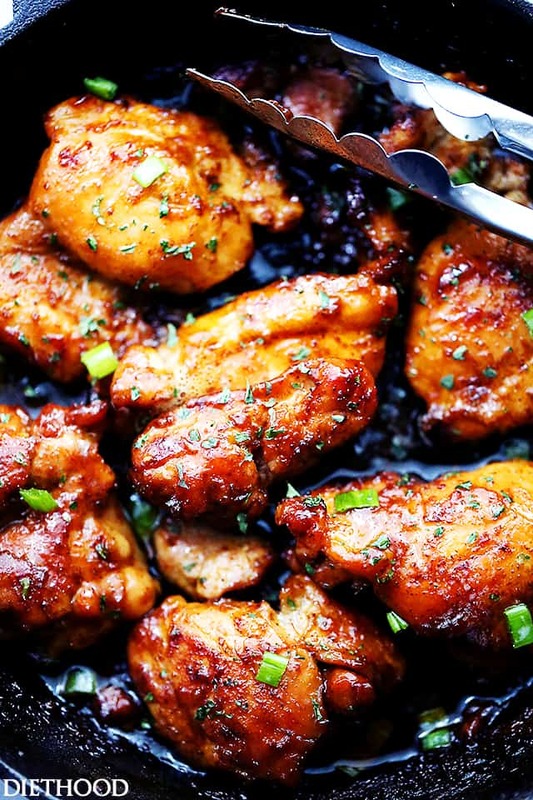 The glory that is this amazingness… If I was this sticky chicken, I’d kiss myself. It’s SO delicious AND pretty. On the other hand, in 2006 I also didn’t really cook my own sticky chicken. Rather, I would hop over to my fave Asian restaurant and eat up all-the-chicken, trying to cure a Saturday night hangover… Fun dayz. And nights! Regardless of my 20-something shenanigans, though, if you want to be extra deliciously awesome today, I urge you to get this sticky-chicken going, asap. I mean, what can I say about it? It might not be YOUR world’s best thighs, but it’s just what my mouth wants to eat every day all day. Let’s get right down to it. I adore this meal for many reasons, one of them being that you actually make your own spicy spice-rub, and you get to control the heat. Secondly, the honey sauce. It’s just a combination of honey and apple cider vinegar! I might be a bit biased, but I use STAR’s Unfiltered Organic Apple Cider Vinegar and it’s wonderful. Just an FYI. If you want this to be even more awesome, I suggest cooking it in coconut oil – ohhhh yes. From the moment you taste it, it’s going to have you hooked to this flavor-loaded, saucy, sticky and sweet treat. Also, judging by how closely our food tastes align most of the time, I’m going to guess that you’ll love this just as much as me, and it will be added to your rotation just as it has been a part of mine for a long time. P.S. One more thing that you and I love – this all happens in just one skillet. Or, one cast iron skillet. ’tis all. Love ya! 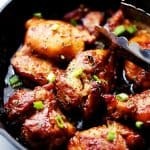 Spicy, Sweet and Sticky Chicken Thighs - An easy and quick one skillet meal including sticky, tender and delicious chicken thighs rubbed with a homemade spice rub and brushed with an amazingly sweet honey sauce. Melt coconut oil in a cast iron skillet over medium high heat. 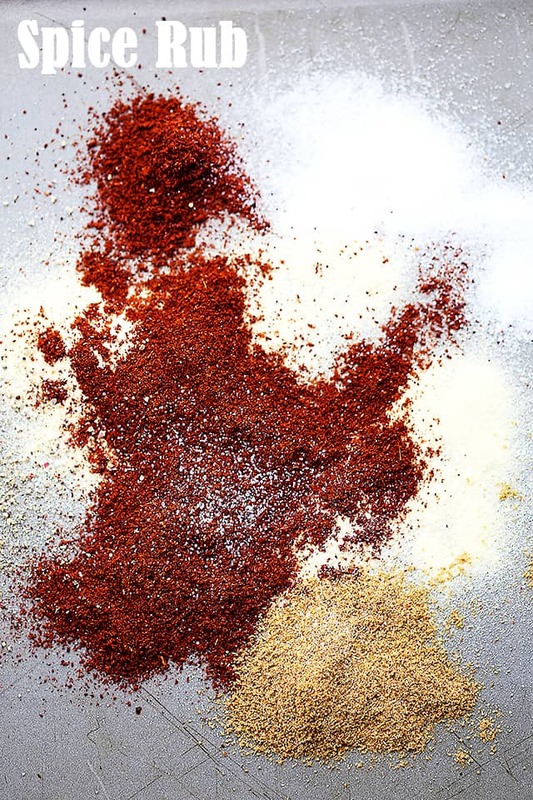 Combine the spice rub ingredients and mix until thoroughly combined. 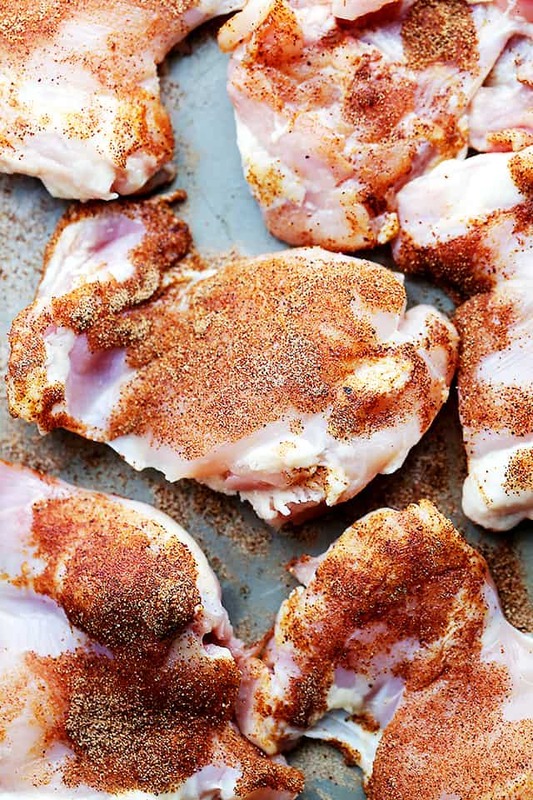 Rub the chicken with the prepared spice rub and toss to coat. Add chicken to skillet and cook for 5 minutes on each side, or until browned. 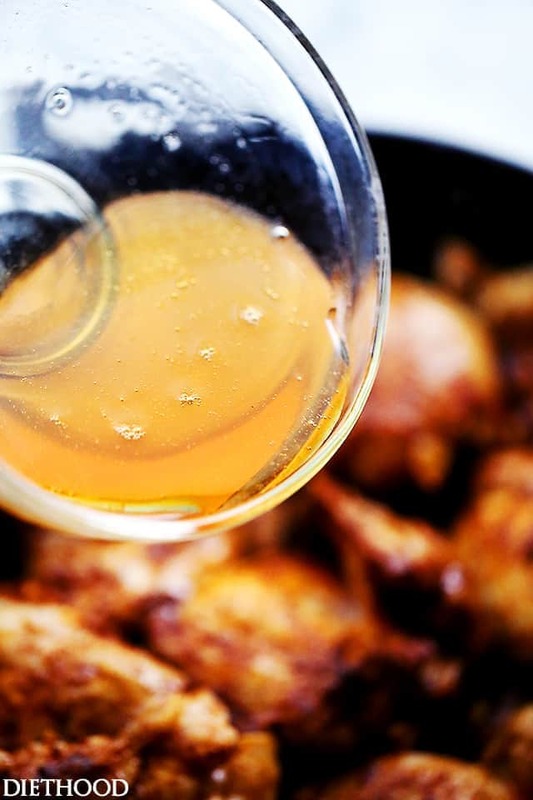 Prepare the honey sauce by combining honey and apple cider vinegar in a mixing bowl; stir until well incorporated. 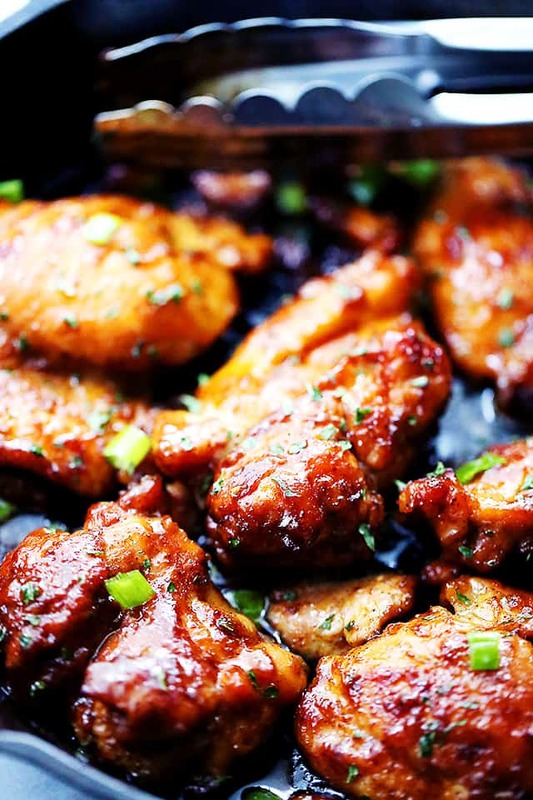 Remove chicken from heat and pour honey sauce over the chicken thighs, turning to coat. Bake in oven for 25 to 30 minutes, or until chicken is cooked through. Plate and garnish with green onions. You may want to double check your nutrition calculator. It is off. There is no way that a recipe for 4, that requires 1/2 tsp of salt has only 12% sodium in a serving. There is naturally occurring sodium in many of the other ingredients, and those calculations ONLY seem to count the added salt. The calculator I used -inputting the recipe with NO added salt as we are on a low sodium diet- still came up as 11% sodium per serving. I used skinless/boneless breasts as well, but nothing else was changed. We will still be trying it (without added salt) in the very near future, but I always check the nutrition info out, since I’d like to keep my husband alive (he is where the ‘low sodium’ comes in) and thought you may want your information to be more accurate. I know you use a calculator (obviously!) but something is off in it’s calculations. This was soo yummy! I’m really glad I tried it out. I used chicken thighs skin on/bone-in and butter for frying instead of coconut oil. I adjusted the spices a bit for four thighs and would recommend using a bit of garlic salt as well. I had them in the oven at 350 degrees (lower heat because a commenter suggested this to not burn the honey sauce) for around 40 minutes (because of the bone-in). Delicious! Thank you! This was good but it is DEFINITELY not Asian flavored. The chili powder made it taste Tex-Mex. My kids agree. Maybe the chili powder was supposed to be something else? I am plant-based (Vegan). I am thinking about using Firm Tofu instead of Chicken and Agave instead of honey. This recipe looks great and I am excited about trying the conversions. How well does this recipe work on the BBQ? Is it possible to make using bone in skin on thighs? Sure! But, they’ll need a bit longer to cook.. maybe about 8 to 10 minutes longer in the oven. Can the entire dish be made in a pan on the stove? This was delicious! I plan to add a little more spice next time, but even just the spice blend alone would be delicious! These are soooooooo good!… I followed the recipe exactly and they were DEEEELICIOUS! My husband even said “could you do this again with the other things we have in freezer?”…… They were a big hit .. very flavorful, tender and something I would definitely serve to company! This is my husband’s new favorite I tried to give it a 5-star rating, but it doesn’t seem to be working. I love everything about this recipe–quick, easy, tasty, and only one pan to clean! hi, it turned out well but the honey got burnt in the pan while baking, how do i avoid that? Use a smaller baking dish, …… the bigger pan allows the honey to spread thinly and it will burn when cooking over a longer time at that heat, whereas in a smaller dish the sauce just ‘pools’ in and around the chicken. This was so delicious! Can’t wait to make again next week. What are you pouring over the chicken after it is baked? Is that how much sauce it makes while baking? Yes, there will be a bit of sauce left in the pan to pour over the chicken. Great recipe! I use olive oil and it turns out delicious. I also like to add a pinch of cayenne to turn up the heat a little bit. I love meals that I can get started on the stovetop and throw in the oven. While it is cooking in the oven, I whip some rice and sauteed greens. This has become our go-to for an easy asian-style weeknight meal. Thanks! Hi, I want to make this but don’t have a cast iron skillet, could I brown in pan and then add to a casserole dish and bake? can u use chicken breast or tenders? Well, I did something wrong. I should have doubled the spices and sauce for ten skinless boneless thighs. Came out neither spicy or sweet. Next time. do you have to use coconut oil? For the sauce, do you heat the honey/apple cider mixture in a saucepan? I’m asking because the recipe doesn’t say, and I can’t see how else to liquefy the honey in order to combine the 2 ingredients? Hi! No, you don’t heat it… Just prepare the honey sauce by combining honey and apple cider vinegar in a mixing bowl; stir until well incorporated. Remove chicken from heat and pour the honey sauce over the chicken thighs, turning to coat. Bake in oven for 25 to 30 minutes, or until chicken is cooked through. Sorry to bother you again, but I have one more question. You recommend sauteeing the chicken in coconut oil. Does doing so add a coconut flavour to the chicken? There are 2 types of coconut oil, one with the flavor and one without. Research to make sure you get the one That you Want. Do you have to use coconut oil? What’s the alternative? Hi! You can use olive oil, or even butter. Tried this the other day. Everyone loved the flavours and not only that it was such an easy recipe. I am making this for the third time tonight. My whole family loves it. And it is super easy to make. Thank you for such a great recipe. 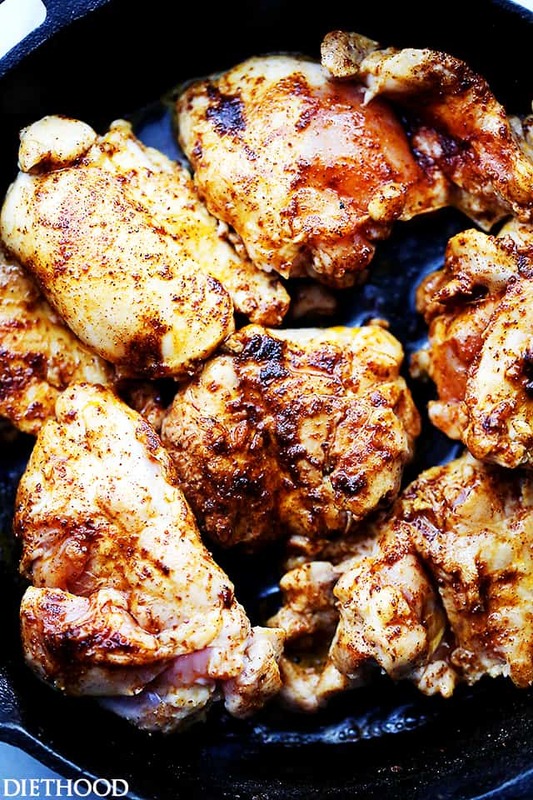 Stumbled upon your site tonight looking for a recipe for boneless, skinless chicken thighs. This is an AWESOME recipe! Super fast and delicious. We will make it again and again. I will check out the rest of your site. I am so glad that you have the calorie count etc. Missing on so many recipes……. Made this recipe for dinner tonight, and I wish I had made more! This is definitely a new favorite! Thank you so much for sharing! Any recommendations on side dishes? I made this and it’s as glorious as it appears to be. I want to make it again, for a potluck tomorrow night, but I won’t be home until 15 minutes before I have to take it to the potluck. I’m considering if this would be just as good if I put it in the crock pot. Any thoughts? Nice, but one thing that bothers me: how can you get 252 cal. out of 2 grams of chicken? because that what is published by you! times. Thanks for sharing such a great recipe. You’re becoming the queen of chicken dishes – they all look amazing! I’m dying over this! Everything about it looks amazing! This is my kind of dinner! Looks SO good! you are kidding aren;t you -2 thighs for 4 people? From Costco/Sams they will fit in the palm of your hand..
Sweet and spicy is the best way to have chicken! Oh, yes! I miss those lazy Sundays!! One day they will be back and then I’ll be too old to sleep in any more…hahaha!! Please pass me a plate for dinner tonight-divine! Grabbing takeout is okay in my books, but when you can make a meal that looks like this, why would you ever go out?!! Lol, seriously, that is amazing looking!! Can’t wait to try this! Looks like it will be a fav! !